...means never having to change welding schedules as sheet thickness, or even the number of sheets being welded, changes. The control also automatically compensates for the presence of corrosion and adhesive, as well as electrode wear. ...are used to offset or counterbalance the weight of the press slide and upper die. Press manufacturers designed these adjustable systems to prolong bearing and gear life, provide smooth operation and reduce motor surge currents in the upstroke of the press. As the Precision Metalforming Association celebrates its 70th year in 2012, we take a look at the roots of the association, which can be traced back to the Pressed Metal Association, born in 1913. PMA later became the Pressed Metal Institute and then the American Metal Stamping Association (AMSA). In 1972, AMSA celebrated its 30th anniversary by publishing the "History of the American Metal Stamping Association." Here's an abbreviated version of that historical record. 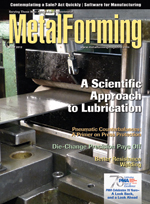 The Precision Metalforming Association, in its 70th year, continues to provide exceptional value, according to executives from several long-time member companies. Says one: "Networking through PMA is key to our success. You don't have to be smart, you just have to be smart enough to learn from others." There are many reasons why middle-market owners wanting to sell their companies during the next 10 years should consummate a sale no later than 2014. Although most points discussed in this article apply to all companies, the article is primarily directed at companies with transaction values between $5 million and $250 million. A Rheem Water Heating plant enjoys the benefits of installing new die lifters and clamps on three of its biggest presses. Thanks to a reduction in die-change time by as much as 28 percent on its most challenging dies, productivity on three big presses has climbed by 10 percent. Chicago-Based Fabricator Acquires a Portion of Mayville Products Corp.